The Carpentier –Dempsey fight represents, among other things, a crucial moment in the breakthrough of boxing as big business. Capitalizing on the burgeoning interest in the sport in the wake of World War I, Carpentier-Dempsey created a truly international and truly mainstream interest in the sport, a level of interest that had never been seen before. The national mind became as never before an instrument upon which a few men could play. And those men were learning […] to play upon it in a new way—to concentrate upon one thing at a time […] They discovered […] that the public tended to become excited about one thing at a time. […] the insignificant Gray-Snyder murder trial got a bigger “play” in the press than the sinking of the Titanic; Lindbergh’s flight, than the Armistice and the overthrow of the German Empire. […] when something happened which promised to appeal to the popular mind, one had it hurled at one in huge headlines, waded through page after page of syndicated discussion of it, heard about it on the radio […] and (unless one was a perverse individualist) enjoyed the sensation of vibrating to the same chord which thrilled a vast populace. The country had bread, but it wanted circuses—and now it could go to them a hundred million strong. No circus lent itself more perfectly to this treatment than boxing. It is by no means a coincidence that Allen chooses Dempsey’s training camp as an example of the kind of news that bonded people from coast to coast and across the demographic spectrum. The very first of the big boxing circuses, the one that set the gold standard for newspaper hype, was Carpentier-Dempsey. A serial narrative of boxing, with Carpentier and Dempsey as its main characters, was consumed widely and with great enthusiasm. Boxing sold papers, which in turn generated further interest in boxing. Because newspaper readers came from across a broad socio-economic spectrum, newspapers’ coverage of boxing created interest in the sport in middle-class homes; newspapers helped create a new middle-class taste for prize-fighting. The very fact that an upstanding organ of the middle classes such as the New York Times devoted as much space to the after-fight coverage as did its more sports-minded, less middle-brow counterparts is testimony to the powerful nexus of pugilism and journalism. The role of Carpentier, at once the photogenic darling of the journalists and the clean-cut idol of women and the middle classes, cannot be underestimated in an analysis of this phenomenon; indeed, it is hard to imagine things having unfolded as they did without him. The result was that the prizefighters of the million-dollar era were better known to the readers of newspapers than members of the reader’s own family. They knew all there was to know about them. If they had not seen them personally, they had seen them in moving pictures or newsreels or in still pictures. These men had become a part of the daily life, literally, of millions upon millions of people. Thus, when they were signed for a fight, it was just as though a personal friend or a close relative were suddenly involved in an unavoidable brawl with a neighbor down the block. By Jove, you knew him too, and all about him; and you certainly wouldn’t want to miss being around for the squabble. These prizefights, too, always managed somehow to point up the individual life-dramas of the men who were engaging in them, and climax real situations in their careers that were better than any stage play. Not everyone had to be content to read about the fight in the newspaper; the were also unheard-of number of spectators physically present in Jersey City as well. As Roger Kahn says: “No fight on record had ever attracted more than twenty thousand spectators, but Dempsey and Carpentier and an enthusiastic press were creating a new world of boxing.” (232) The jump from 20,000 (the number estimated to have been present at the Dempsey-Willard fight in 1919) to the estimated 80,000-90,000 present at Carpentier-Dempsey is indeed, both numerically and culturally, a monumental leap. The fight not only drew, by a factor of at least four, a larger crowd than had ever before been seen at a boxing match but the largest crowd at any sporting event. 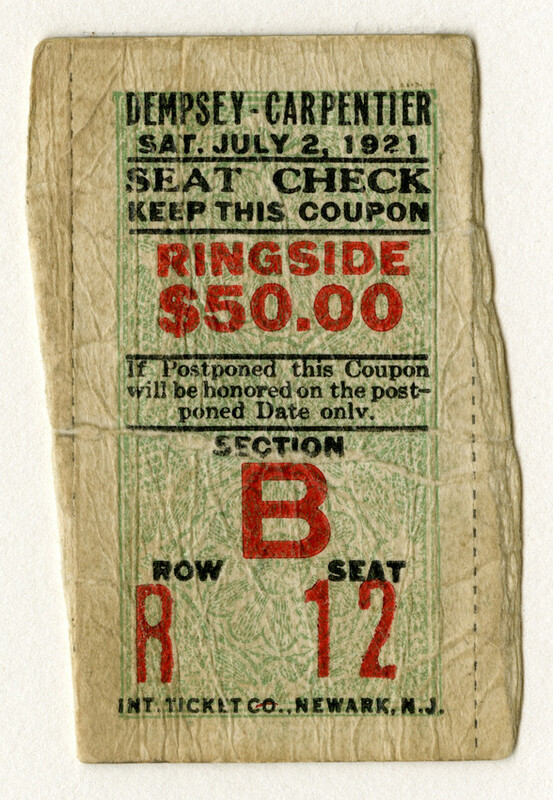 The gate receipts were famously record-breaking, due not only to the record-breaking number of tickets sold but also to the record-breaking per-ticket prices (as much as $50 for a ringside seat). The July 3, 1921 edition of the New York Times gives the round number of $1,600,000 and compares it to the previous biggest gate in history (Dempsey-Willard, $452,522) and the one before that (Johnson-Jeffries, $270,775). In Round by Round, Dempsey says the gate was $1,626,580 and says the figure is about four times more than Dempsey-Willard and nearly six times that of Johnson-Jeffries. Historian Randy Roberts gives the figure $1,789,238 and says that it was “well over twice as much as any previous fight.” Despite some discrepancy in dollar amounts, the point remains the same in all versions: the gate for Carpentier-Dempsey dwarfed previous dollar amounts taken in for a boxing match or any other athletic contest. Carpentier-Dempsey represented in fact the beginning of a new era in sports in which everything would be bigger: crowds, money, interest, press coverage. Obsessive mass interest in the serial narrative of the heavyweight division would become a mainstay of American culture. Despite several dormant periods, that would remain the case through Muhammad Ali’s big fights of the 1970’s. The exact end-point of that cultural phenomenon is perhaps debatable but its starting-point is absolutely clear: the Carpentier-Dempsey fight in 1921.